Fact: Pinoys take pride in being practical. Who wouldn’t jump at the chance to save a bit of cash? We always want to get the most bang for our buck, and we’d go to some extreme, borderline kapal muks measures to do so. Case in point: these proudly Pinoy antics below! If there’s a vendor, you’re bound to see a Pinoy in the vicinity haggling for a lower price. “Last price?” Walang ganyan sa’tin! At every party, there’s bound to be a guest armed with a handful of Tupperware, ready to whisk away what’s left of the buffet when no one’s looking. Admit it—we all have a tita who will cart off a whole relyenong bangus as long as it’s not entirely annihilated. In a Pinoy household, today’s lechon is bound to be tomorrow’s lechon paksiw. Why whip up a whole new dish when you can still create a masterpiece with last night’s leftovers? We take the art of packing very, very, very seriously. When faced with an empty balikbayan box, we’re going to fill it to the brim with tissue paper and soap until it reaches the maximum weight limit. If Daenerys Targaryen is the Mother of Dragons, us Pinoys are, to quote Rex Navarete, the Mother of all Packers. We’d gladly endure an hour or two leafing through overstuffed racks of clothes in a hot, cramped ukay-ukay just to be able to take home a shopping bag filled to the brim with dirt-cheap clothes. Sure, it sounds like a stressful shopping experience, but it all becomes worth it once you nab a branded polo (with the tags still attached!) for only P20. Oo na, walang forever. But our favorite restaurants have unli-rice, unli-gravy, unli-drinks, unli-breadsticks, unli-pizza, and unli-pasta, and that’s close enough! The insane EDSA traffic during the Ortigas malls’ three-day sales is a testament to the Pinoy’s love for all things discounted. After all, why would you pay full price for something when you can get it at 50 percent off in a few months, right? Pinoys take their discount coupons very, very seriously. It doesn’t matter if it’s a free drink upsize or a trial session at a gym—as long as it’s free, we’re very willing bait. Commuting folks regularly encounter parents who have made many a mischievous kid perch on their laps for hour-long rides just to avoid paying a few extra pesos in jeepney fare. If you’re one of those parents, hats off to your undying patience! We’re of the firm belief that the whole jejespeak phenomenon started because Pinoys wanted to really maximize each of the 160 characters allowed in a single text. We’d do the same if our networks didn’t offer value-for-money plans with unlimited calls and texts. Luckily, there’s the Sun Postpaid Best Value Plan 599, which offers unlimited calls and texts to fellow Sun users, 400 texts to other networks, a whopping 400MB of data, and—as if that isn’t enough—a Samsung phone and a tablet. Sulit kung sulit, 'di ba? 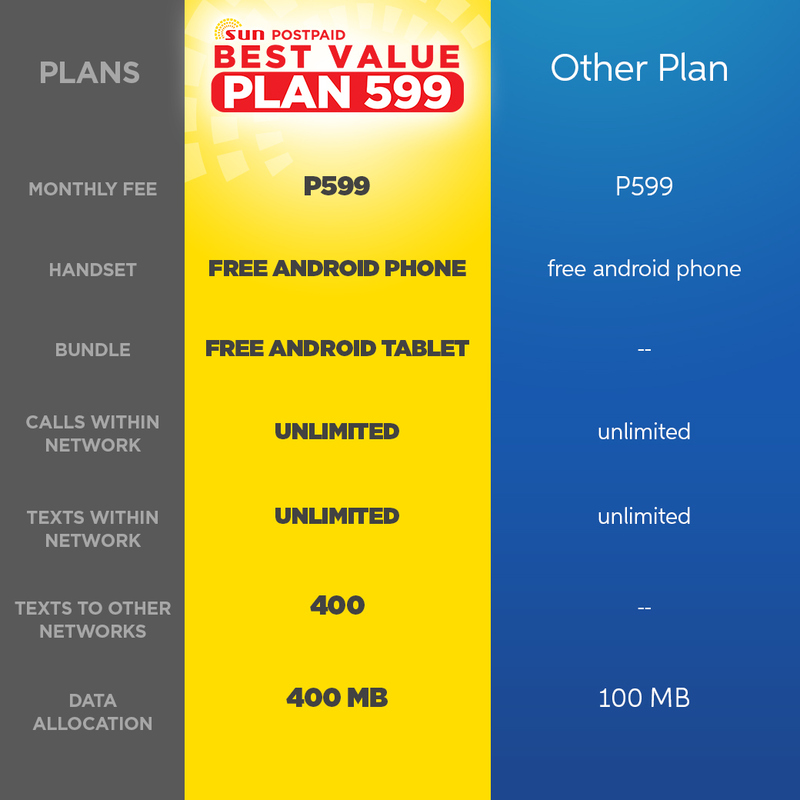 To know more about Sun Postpaid Best Value Plan 599, click here!